We're often asked about some of the main features of our Stainless Steel IP67 Panel PC series. In this edition of the Winmate Newsletter, we delve into some of the main features and uses. The Winmate rugged, industrial-grade Panel PC series is built to withstand challenging environments, undergoing rigorous testing to ensure safety and top performance. All of the models in the series are sealed to at least IP65 standards, the Stainless Steel IP67 Panel PC, however, is sealed to IP67. 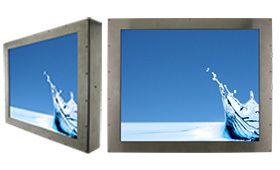 ● Screen sizes available in 10.4", 15", or 19"
The onboard connectivity consists of four highly configurable waterproof, IP67-grade I/O ports . Standard configurations offer 2 x USB, LAN, COM2, and DC Power via waterproof IP67-grade connectors. The Full IP67 Stainless Steel series is a special version with superior sealing, which means even when the device immersed in up to 1 meter (3.3 ft.) of water, it will still work. Full IP65 means the device is protected against water sprayed form all direction. When you need a tough and dependable device, look no further than Winmate. We provide top- of- the -line tough and rugged mobile devices to meet all of your needs. Copyright 1996-2014 WinMate Communication INC. All Rights Reserved.